Yesterday the 30th Rolex Middle Sea Race had its first boat home and today it appears to have its winner. Andres Soriano's Alegre (GBR) looks impregnable in first place as day four draws to a close. It will take a miracle for anyone on the course to finish inside the time set by the 69-foot Mills design. 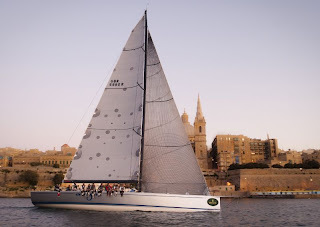 By 18.30 Tuesday evening, eleven boats had completed the 606 nautical mile course, with Nikata(GBR) crossing the finish line just after five pm, followed by Nadejda (RUS) andCalipso 4 (ITA) as the sun set over Valletta. The remaining yachts still racing are spread between Favignana and Lampedusa. What was a fast ride for some has proved a painfully slow one for others. Unquestionably, this year, the prevailing weather has favored the larger yachts in the battle for overall victory. A complete turnaround from 2008.